Military trucks and chassis of many types of different vehicles of the past and present Czech or Czechoslovak Army are products of the Tatra company, member of the Czechoslovak Group (CSG). Tatra is the second oldest car producing company in the world, after the French Peugeot. The company was founded in 1850 and was given the Tatra badge in 1919. Its trucks and chassis serve in many armies around the globe, and its innovative chassis in 4x4, 6x6, 8x8, 12x12 configurations are used for modern military vehicles for many roles from small Tactical APCs to cruise missile carriers. The company produced the first Czech car, the Präsident in 1897. And a year later came its first truck. Serial production of trucks started in 1915 with 105 TL-2 vehicles. The mass production of trucks started in the middle of the 1920s, during the era of the first Czechoslovak republic (1918-1938). In 1923 a chassis consisting of a central load-carrying tube, at the end of which a directly air-cooled engine and transmission were installed with independently mounted swinging half-axles, was introduced as a new product, and marked what was called the Tatra concept. A six-wheeler model T72 was the first one largely used by the army as cargo and personnel transport. It was also manufactured under license in France, followed by T82, 92 and 93 built for the Romanian army, already under the nazi occupation regime (1939-1945). After 1945 Tatra was established as a state-owned company. In 1942 the T81 model evolved into the famous T111: 33,690 were produced from 1942 till 1962, followed by the T138 and T148, exported to 53 countries around the world, with over 100,000 produced until 1982. In 1967 came the first four-axle design, the T813 8x8 Kolos platform, with modular construction technology. T815 was introduced in 1982, with simplified construction and more powerful engine, using the traditional tatra concept of rigid backbone tube and swinging half-axles giving independent suspension. The vehicle, designed for extremet off-road conditions, exists in all imaginable chassis configurations: 4x4, 6x6, 8x8, 10x8, 10x10, 12x8 and 12x12. Many were and are still produced in military variants from simple 4x4 troop transport to the 12x12 BrahMos supersonic cruise missile carrier of the Indian army. It was completed in 2008 by the T810 model, a medium truck at 4x4 or 6x6. 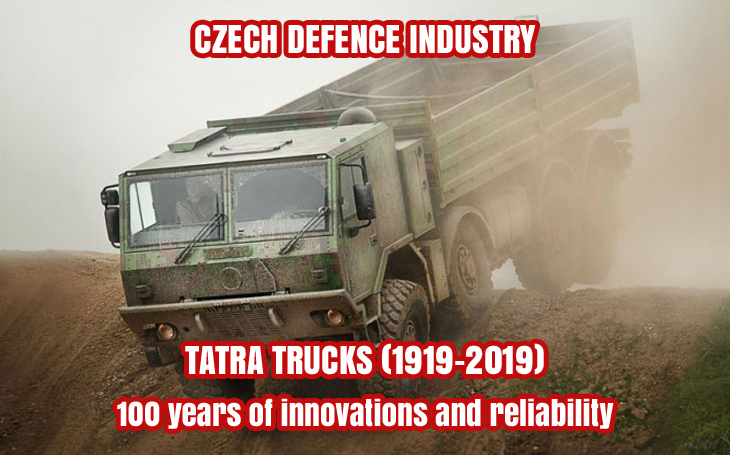 The Czech Army uses over 600 T810 6x6 vehicles, and about 2700 T815 4x4, 6x6 and 8x8 models, including the Tatra 815-7T3RC1 8x8.1R Armoured Double Cab delivered in July 2017. It serves in all imaginable roles: troop and cargo transports, container carriers, refuelers, recovery vehicles, cranes and more. Also the Self-propelled Gun Howitzer 152 mm type 77 „DANA“ is built on Tatra 8x8 chassis. And by far it is not just the Czech Army. In 2017 the French company Nexter was awarded the tender for delivery of new howitzer systems for the Danish Army: the CAESAR 8x8 on the Tatra chassis. New Wheeled Command Post Vehicles and Wheeled Armoured Communications Vehicles TITUS by Nexter are built on TATRA 6x6 chassis, the Patriot Tactical APC uses a TATRA 4x4 chassis, etc. The actual production lines of the TATRA military vehicles are presented in this pdf brochure.